There will be a licensed bar or bars for this event under the auspices of a TEN licence from Bromley Council. Refreshments may be purchased before the performance and during the interval only. The usual alcohol licensing law applies. Olivia has played at all of London’s major concert venues including the Royal Albert Hall, Royal Festival Hall and Wigmore Hall. Olivia is the resident harpist at The Orangery, Kensington Palace and the official harpist for the Wimbledon Tennis Championships. After studying at the University of Manchester, Olivia graduated with a Masters degree from the Royal Academy of Music in 2013. That year she was selected by the London Philharmonic Orchestra to join their Foyle Future Firsts scheme: a competitive training programme for young instrumentalists. She has gone on to play with orchestras such as the BBC Symphony Orchestra and Royal Northern Sinfonia. In 2016 Olivia held the coveted harp job in the West End run of Jeff Wayne’s War of the Worlds at the Dominion Theatre. Highlights of 2017 included Britten’s Midsummer Night’s Dream in the Aldeburgh Festival Orchestra and a solo recital playing Britten’s Suite for Harp at the composer’s former house. 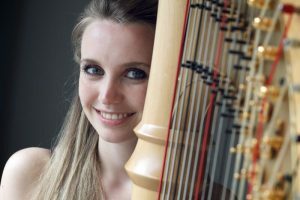 Last year Olivia’s harp-writing resource 15 second harp was also shortlisted for a Royal Philharmonic Society Award. The RPS awards, presented in association with BBC Radio 3, are the highest recognition for live classical music in the UK. Olivia also founded Bachn & Eggs,London’s first series of classical music brunch concerts, which is regularly listed as one of London’s top pop-up events. 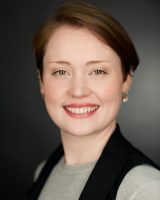 Elizabeth Unsworth-Wilson is a mezzo-soprano currently studying the Artist Masters programme in Historical Performance at the Guildhall School of Music and Drama, supported by the Glasgow Society for the Benefit of the Sons and Daughters of Ministers of the Church of Scotland and currently holds a Guildhall general scholarship. She completed her BMus at Goldsmiths, University of London, where she focused primarily on contemporary repertoire. Elizabeth has performed with a number of chamber groups in and around London. She opened the London Handel Festival with the Amadè Players and performed as the alto soloist in Bach’s Die elenden sollen essen with the Wild Street Ensemble. She performs in occasional services at the chapel of Thomas Guy, Southwark Cathedral and St Paul’s Cathedral. She currently holds the alto choral scholarship at St George’s Church in Beckenham also performing as a soloist. While at Guildhall she has performed with the Guildhall Cantata ensemble as part of the London Handel festival, in Baroque opera scenes within Guildhall, in the Guildhall Consort and most recently as part of a small five part ensemble. Prior to her studies in London, Elizabeth held a scholarship with St Salvator’s Chapel Choir, the flagship choir of the University of St Andrews. While in St Andrews she also performed with the university’s Gilbert and Sullivan Society, as the Duchess in The Gondoliers and the Consul in Trial by Jury. She was also in the St Andrews Opera production of Acis and Galatea as part of the eight-part chorus. This summer she took part in The Kellie Consort’s tour of Scotland as an alto and second soprano soloist. Her upcoming engagements include lute song concerts in Milngavie and London and various collaborations with colleagues from the Guildhall School of Music and Drama. Paul is well known in the Bromley area and has performed with many leading choirs locally both as chorus singer and soloist. He sang for nearly twenty years at St. Paul’s, Crofton in Orpington before moving to Bromley Parish Church and later St. Giles Cripplegate in the Barbican Estate. He has now been a regular member of the choir at St. George’s Beckenham for over 8 years. He first trained with Rodney Williams (formerly of Westminster Abbey) and subsequently with Nigel Beavan at St. Paul’s Cathedral. His London appearances as a soloist have included ‘St. Matthew Passion’ at The Royal Albert Hall with Sir Willard White and numerous concerts at The Royal Festival Hall and Purcell Room with The London Cantata Choir. Paul currently performs with The Purcell Singers and Exmoor Singers of London in venues including St. Paul’s Cathedral, St. James’s Piccadilly, St. John’s Smith Square & St. Martin’s-in-the-Fields. Some recent solo performances include Handel’s Messiah, Christus in Bach’s St. Matthew Passion, Mozart’s Requiem, Stainer’s Crucifixion, Faure’s Requiem, William Lloyd Webber’s The Saviour, Haydn’s Nelson Mass & Bach’s Christmas Oratorio. When singing engagements allow, Paul is Company Secretary to a national charity. The choir of St George’s is well-known locally, nationally and internationally. It has recently been described by one cathedral dean as, “The finest Parish Church Choir in the Country”. In addition to singing for two fully choral services on Sundays and for major weekday festivals, it has a long history specialising in singing the services in the country’s major cathedrals when their choirs are on holiday, in broadcasting and in international touring. The repertoire is vast, and is based on that of a cathedral choir. The choir is comprised of auditioned volunteer adults who in many cases are professional musicians, teachers and ex professional singers. Many work in London and the surrounding areas, and several travel some distance on a regular basis to be members of the choir. More recently, the Choral Foundation has developed paid choral scholarships for men and women in their late teens and early twenties. 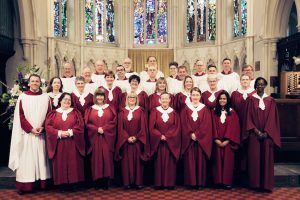 This has provided a wonderful opportunity, and the choir is immensely grateful for the support of the Friends of Cathedral Music, who have recently awarded a grant of £25,000 to help fund the choral scholarships and augment the FCM’s initial grant of £10,000 which they generously made several years ago. 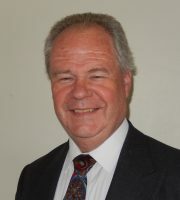 Marcus Wibberley is Organist & Director of Music here at St George’s, Beckenham. Since his arrival in August 2017, he has introduced new repertoire and new members to the choir, conducted the choir at a number of cathedrals, worked in conjunction with the Hammig String Quartet and – in July 2018 – will be taking the choir on tour to Estonia, its first foreign tour in a number of years. Before returning to Beckenham (he was ‘Organ Student’ here in the late 1990s), he was Director of Music & Organist of Hexham Abbey, where his responsibilities included training and directing the Abbey Choirs. In addition to the four weekly choral services at the Abbey, he appeared with them in concert both elsewhere in the UK and in Germany, Belgium and Estonia. Marcus was also Festival Director of the annual Hexham Abbey Festival of Music & Arts, for which he developed the scope of the programme and secured majority funding from the Arts Council of England. Marcus was a Chorister of Westminster Abbey under Martin Neary, and his organ teachers included Martin Baker and John Scott Whiteley. He studied at Dulwich College, where he was a Music Scholar, and the University of Hull, where he was University Organ Scholar, graduating with first class honours in Music. He held organ scholarships at Chichester Cathedral, Beverley Minster (while a student in Hull) and latterly York Minster before becoming Sub-Organist of Portsmouth Cathedral and the Diocesan Music Adviser of The Diocese of Portsmouth in 2005. Marcus is in demand as a recitalist, and has travelled extensively. Recent performances have been given in prominent venues in Japan, France, Belgium, Germany, Denmark and Estonia, as well as most of the major cathedrals and abbeys in the UK. Dominic Moore is leader and musical director of the SGCO. 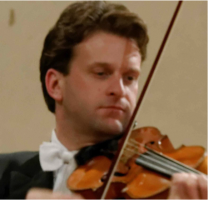 He studied violin & piano as joint first instruments at the Royal College of Music. Dominic has performed as leader with the Ulster Orchestra, Royal Liverpool Philharmonic, Bournemouth Symphony, Orquestra Nacional do Porto, Presteigne Festival Orchestra, Birmingham Royal Ballet and is assistant leader of the West End production of Phantom of the Opera. The St. George’s Chamber Orchestra (SGCO) was founded in 2004 as the professional orchestra for the South East in order to give local music lovers the opportunity to hear orchestral concerts of the highest standard on their own doorstep, and indeed for the musicians to enjoy making music together on their own doorstep! The orchestra is drawn from an extraordinarily talented, experienced and versatile pool of musicians, a large number of whom are past winners of prestigious awards and musical competitions in the UK and elsewhere. Many either are or have been members of the leading London orchestras and a significant number are principals in those orchestras. Many others are members of Britain’s best known chamber ensembles. St. George’s has a long, strong and respected musical heritage, and boasts one of the finest church choirs in the UK. With its spaciousness, good acoustics and warm friendly atmosphere the church is an ideal venue for a chamber orchestra.